The Form ADV is a required submission to the Securities and Exchange Commission (SEC) by a professional investment advisor. The form outlines the investment style, assets under management and key officers of the firm. 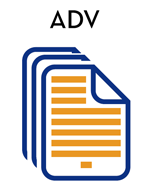 Investment advisory firms are required make this form available to the public.